The Size of Modern Submarines - Not What You Imagined! 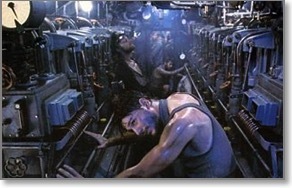 When most people think of submarines, they think of the small, grimy diesel submarines they see in movies. The U.S. Navy's submarines are nothing like that - they're practically spotless, huge submarines. For example, the Ohio class (Trident) submarines are almost 2 football fields long, 7 stories tall from keel to sail, and wide as a 3 lane highway. It's hard to realize how big they are because most of it is submerged. Only out of the water can you get an appreciation for how big they are. The pictures to the right are of the same class of submarine (Ohio Class), and the second picture has two identical submarines, one on the pier and one in the water next to it. There are 3 types of fast attack submarines in the U.S. Navy. The oldest and most familiar, made famous by Tom Clancy in The Hunt for Red October, is the Los Angeles (688) class, which still makes up the bulk of our fast attack fleet. - We have 3 Seawolfs, huge Cold War submarines with 8 torpedo tubes, capable of carrying 50 torpedoes each. These are very capable submarines but came with a corresponding price tag, and with the end of the Cold War, the Navy needed a more affordable submarine. - Enter the Virginia class, with 10 of them in-service as of 2013, leveraging the Seawolf and even more innovative technology. 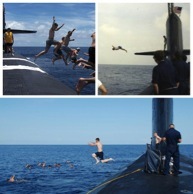 - The top two pictures are Los Angeles class submarines. Notice the top left submarine has "Sail Planes" while the top right doesn't. The Navy moved to bow planes vice sail planes during the construction of the Los Angeles class. The Seawolf is the bottom left and the Virginia is the bottom right. Note the funky shape of the front of the sail, which is that way for hydrodynamic purposes, reducing drag through the water at high speed. We have one type of ballistic missile submarine today - the Ohio class, sometimes referred to as the Trident class because it carries the Trident missile. 18 Ohio class submarines were built, but we have only 14 SSBNs because 4 were converted into SSGNs (more on that below). - Each SSBN can carry 24 missiles, with each missile carrying multiple warheads, and every second of every day, there are always several SSBNs at sea on Alert patrol, ready to launch its missiles at a moment's notice. When people talk of the nuclear "Triad", they're referring to the triad of nuclear launch platforms - bombers, land-based ICBMs, and SSBNs. - SSBNs are the only survivable leg of the Triad against an enemy attack, because no one knows where they are when they are at sea, not even our own Navy. The SSGN is a variant of the Ohio class SSBN, modified to carry Tomahawk missiles instead of nuclear warhead-tipped ballistic missiles, and also modified to carry two platoons of Navy SEALs and their equipment. - With START nuclear warhead limitations, the Navy had four extra Trident submarines, and rather than decommission them with 20 years of life left, the Navy converted them into special warfare platforms. - 22 of the 24 missile tubes are modified to carry Tomahawk missiles in 7-pack launchers, with the 2 remaining tubes modified into access trunks to Dry Deck Shelters (DDS) if they are attached to the submarine's Missile Deck. Each DDS is capable of carrying a SEAL Delivery Vehicle (SDV), a 4-man min-sub. Welcome to the second topic of Submarine 101, where I’ll be taking you inside the U.S. Navy's nuclear powered submarines. I'll start with a basic overview. 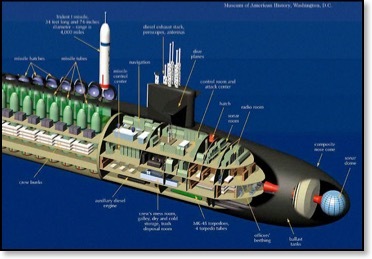 Additionally, the Ohio class (Trident) submarines (SSBNs and SSGNs) also have a Missile Compartment between the Operations Compartment and Reactor Compartment. Although not a compartment or level, let's start with the space in the top of the submarine's Sail, called the Bridge Cockpit, or simply the Bridge. On the top of the Sail, or conning tower for you WWII types, the Bridge is where the submarine is controlled from when it's on the surface. The Officer of the Deck, or the Captain depending on how delicate the evolution is, gives orders from the Bridge cockpit, as you can see in the picture. However, if the weather is really bad, such as when waves are breaking over the top of the sail, the watch is sometimes moved below-deck and the submarine is controlled from the Control Room, like it is when the submarine is submerged. Unfortunately, you're then limited to what you can see through the periscopes. But at that point, you've moved the watch below-deck because the weather is so bad the visibility from the Bridge has deteriorated to the point you can't see much from the Bridge anyway. I'll start with the Control Room. 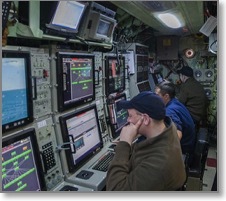 There are 2 types of Control Rooms - the traditional type and the new type aboard the Virginia class submarine. The picture in the post (Ohio class) is the traditional type with hull-penetrating periscopes. 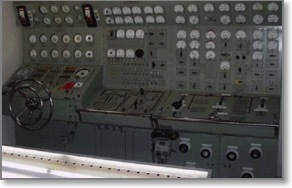 In the picture, you're standing at the front of the Control Room next to the Ship Control Panel. The Helm is on the left and the "Outboard" watchstander is on the right, and seated between them is the Diving Officer of the Watch, often referred to as the "Dive". To the far right is the Chief of the Watch, along with what appears to be the Messenger of the Watch. - The Helm steers the ship (with the rudder) and controls the sail or bow planes (one or the other depending on ship class), and the Outboard controls the angle on the ship with the stern planes. 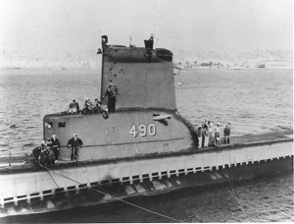 The Dive supervises the Helm and Outboard, as welll as the Chief of the Watch, who controls the submarine's buoyancy as well as raises the submarine's masts and antennas. 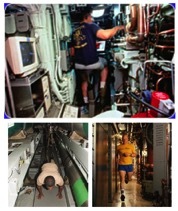 Here you see the Chief of the Watch seated at his panel on the port side of the submarine (left photo), where he can move water on and off the submarine, and also fore and aft (between internal tanks) to control the ship's buoyancy, monitor the status of all hatches and hull openings, and raise and lower all masts and antennas except the periscopes, which are controlled by the Officer of the Deck. The Virginia Control Room is different because the submarine doesn't have hull penetrating periscopes. That means the Control Room is no longer tied to the top of the Operations Compartment, directly under the Sail, and has been moved one level down, where the ship's beam is wider, giving the Control Room more room. 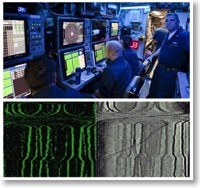 In addition to not having physical periscopes (it has photonics masts controlled by a joystick instead), the Sonar Room has been moved into Control, with consoles along the port side, opposite the Combat Control consoles on starboard (see lower picture) - so... no Sonar Room on Virginia class submarines. - If you think this is heresy, just wait - there are no longer Dive, Chief of the Watch, Helm, or Outboard watchstanders. On Virginia class submarines, these four watchstanders have been replaced with... wait for it... a Pilot and Co-Pilot who sit at the Ship Control Panel. - I know, for you submarine veterans I probably should have ensured you didn't have any food in your mouth before I told you so you didn't choke. And the Officer of the Deck gives maneuvering orders - "Pilot, ahead standard, right full rudder." I kid you not. - Actually, the Sonarmen "look" for contacts more than listen, and the bottom half of the picture gives you an idea of what they're looking for, although current displays are more advanced. Each bright green trace represents a contact, and the upward angle of each trace represents their movement over time, which can be correlated to a specific course, speed, and range. I couldn't find any photos of submarine Radio Rooms on the Internet (I'm amazed at what I've been able to find so far), but the attached is a radio room trainer. Basically, the Radio Room aptly describes its function, and it normally consists of two consoles, connected to the submarine's radio masts in the Sail and one or both of its periscopes for transmitting and receiving, and to several racks of equipment in the Radio Room for decrypting and encrypting the transmissions. - Normally, a submarine proceeds to periscope depth and "copies or downloads the broadcast" through a receiver on top of one of its periscopes. Other communication circuits require raising a specific antenna from the sail. - SSBNs also have two floating buoys they deploy while on patrol that float near the surface, allowing the submarine to stay several hundred feet beneath the ocean's surface, yet stay in constant communication. - Submarines also have what's called the "floating wire" they can deploy from their sail, that they stream behind them several hundred yards like a gigantic antenna, also allowing them to stay in constant communication while submerged (at times). The Torpedo Room is just as descriptive as the Radio Room - your store and shoot torpedoes there. 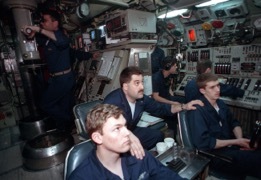 However, on fast attack submarines, you can also store and shoot Tomahawk missiles, and the Torpedo Room also serves as a space for overflow berthing, converting unoccupied torpedo stows into bunks. 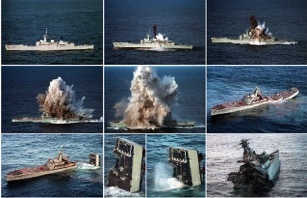 - In the top left picture, you see a torpedo strapped in a stow aboard a 688 class submarine. In the top right, you see a somewhat spacious Virginia class Torpedo Room. That's because the torpedo cradles on the Virginia class are removable, and in the picture, the center stows have been removed. This gives the Virginia class flexibility to reconfigure their Torpedo Rooms so they can store other gear or configure them into SEAL mission control centers, for example. Submarine berthing is always a source of curiosity or of - "I couldn't do that!" comments. 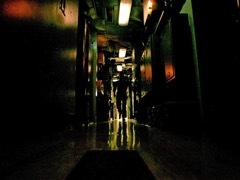 The bulk of the crew lives in a main berthing compartment (top right photo) - row after row of "racks" stacked 3 high on each side of narrow passageways. For a 2 and 1/2 month patrol or 6 month deployment, you get what amounts to an aluminum coffin with one side open and adorned with a curtain, a five inch deep stowage bin under your mattress for personal items, and a 3 foot tall locker for storing your dress uniforms. That's it. Settle in for a long voyage with 140 of your best, smelly friends. Officer "Staterooms" have the same bunk arrangements - stacked 3 high, although "stateroom" is a misnomer. 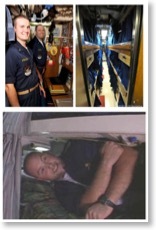 The 3 officers assigned to a stateroom (top left picture) can't stand up at the same time without bumping into each other. However, officer staterooms have two fold-down desks and a fold-down sink, so they're quite luxurious compared to enlisted berthing. Bathrooms aboard navy ships are called "heads", earning their name from sailing days, when they were located at the bow, or head of the ship. - There are 2 main differences between household bathrooms and heads aboard submarines. The 1st is the scarcity of water. Submarines have to distill water they need for drinking, cooking, and bathing from seawater and have a limited supply, so the crew takes "submarine showers" - turn the water on and wet down, turn the water off and soap up. Turn the water on and rinse off. Repeat until done. You can't ever leave the water running anywhere. Not even while brushing your teeth. - The 2nd important difference is that the submarine has to discharge its sanitary tanks every so often. On the older classes (i.e. 688), they pressurize the sanitary tanks and blow them overboard. This is critical, in that you don't want to flush a toilet while a tank is being blown overboard. VERY critical. The toilets are flushed by opening a ball valve that lets the toilet contents flow down into the tank, but if you open the ball valve while the tank is pressurized - see the right side photo for what happens. And yes, it DOES happen. At least once a patrol, it seems a new crew member forgets, despite the sign hanging on the commode door, and he tries to flush the toilet while the tank is being blown overboard. VERY messy." The Emergency Diesel Generator is located in the Auxiliary Machinery Space, which is a critical piece of gear if the nuclear reactor goes down. The battery aboard nuclear powered submarines is very small (more on that tomorrow), so it's imperative the diesel generator be brought up quickly in the event of a nuclear reactor casualty. However, like nuclear submarine batteries, the diesel generator is also small by diesel submarine standards, and is used only to support basic electrical loads while the crew troubleshoots the fault in the nuclear reactor. 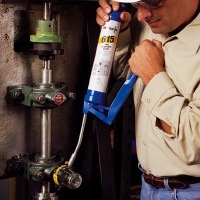 - Atmosphere control equipment (oxygen generators, etc.) are sometimes located in the Auxiliary Machinery Space and sometimes in the Engine Room. More on this equipment in the "Air and Water" topic. As I mentioned earlier, nuclear submarine batteries are small by diesel submarine standards and will provide power for only a few hours before becoming drained. Before that happens, the submarine either has to be at periscope depth with its emergency diesel generator supporting electrical loads, or have identified and repaired the fault in the nuclear reactor. 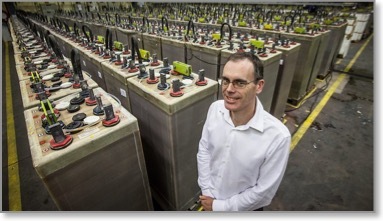 - The submarine's battery isn't one "battery", but typically 126 battery cells connected together. (Think of it as a really powerful D-Cell flashlight.) Each cell is quite big, as you can see in the picture - about 1' x 1' x 5' tall. - As the battery is drained, it's monitored to ensure none of the cells begin "reversing" polarity, which means they've become drained, and they begin charging themselves at the expense of the remaining battery cells. At that point, you're in big trouble. I won't go into much detail about the Missile Compartment, because it's covered in other posts. But basically, it's a four level compartment that contains 24 missile tubes and all the mechanical and electrical equipment it takes to launch them, plus 9-man bunk rooms between the missile tubes on 2nd Level, as well as Medical. You'll usually find the submarine's workout equipment - maybe two stationary bicycles, a rowing machine, a universal weightlifting machine perhaps, on one or two of the levels, where you can get a decent workout. The nuclear reactor is the heart of the submarine's propulsion and electrical system. It's complicated, yet at a the same time it's rather basic - it's a sophisticated tea kettle. 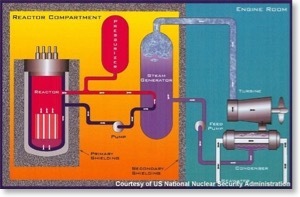 The reactor gets hot and heats the primary water in the core which is sent into a steam generator where it heats the secondary water into steam. The steam is sent into the Engine Room where it powers the main engines and the electrical turbine generators before being condensed back into water and sent back into the Reactor Compartment where it's turned back into steam, and the process repeats. Pretty simple in concept. Just don't let the reactor get too hot, which is the complicated part. - Today's submarine reactors contain enough fuel to power the submarine for its entire life - no refueling required. The Engine Room is where the Main Engines, Electrical Turbine Generators, Electrical Motor Generators, Distillers, and in some cases oxygen generators are located. It's also where the reactor plant, electrical plant, and steam plant are controlled from - the Maneuvering Room (I'll talk about that in a bit). - Submarines normally have 2 of everything that's important, just in case one breaks. (We break a lot of stuff.) - 2 main engines, 2 electrical turbine generators, 2 motor generators (for charging to and from the battery), and sometimes 4 of them depending on the submarine class - 4 main feed pumps, 4 condensate pumps, etc. (We apparently break a lot of those.) However, we have only one propellor shaft. Break that and we're, well... we're up the creek without a paddle. - I couldn't find a good picture of an American submarine Engine Room, because they're a huge, multi-level compartment and photos aren't usually allowed in the Engine Room anyway, so I'll leave you with this one of Das Boat. - The enlisted men each sit in front of a panel - the middle panel is manned by a Reactor Operator, who changes the height of the reactor control rods and the speed of the reactor coolant pumps. 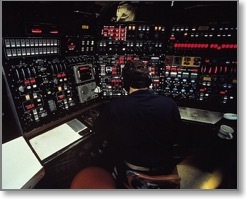 The panel to the right is manned by an Electrical Operator who controls the Turbine Generators that generate electricity and the Motor Genrators that either charge or discharge the battery, and the panel on the left is manned usually by another electrician, who is qualified as Throttleman and is in charge of the Steam Plant. The Throttleman's most important duty is to answer propulsion bells from Control. When the Officer of the Deck orders a new "bell", the Helm "rings up" the new order on the "Engine Order Telegraph" next to him in Control, which relays it back to the Throttleman, The Throttleman then spins the circular "throttle" at his panel to the ordered bell, which opens or closes the valves at the main engine turbines, allowing more or less steam into them. Well, that’s it for the tour inside the submarine! Click on the link below to take you back to the list of topics at the top of the page, or continue on to the next topic, Submarine Armament! Welcome to the third topic of Submarine 101 - the weapons and decoys submarines carry. I'll start with the submarine's most important weapon - the MK 48 Torpedo. 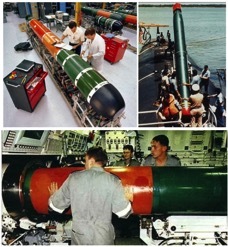 All American submarines carry the MK 48 ADCAP torpedo. The Los Angeles and Virginia class submarines are designed to carry around 25 torpedoes and have 4 torpedo tubes to shoot them, while the Seawolf class, a Cold War behemoth with 8 torpedo tubes, can carry up to 50 torpedoes. The Ohio class submarine, after its Torpedo Room modification, can carry around 13 torpedoes. - Unlike WWII torpedoes, which were "straight-runners", modern torpedoes like the MK 48 have sonars in their noses and are artificially intelligent. They'll ping, process the returns, then decide what to do. 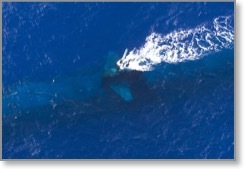 If an enemy submarine ejects decoys, the torpedo will attempt to differentiate between the submarine and decoy. Also, the MK 48 torpedo trails a thin wire that stays connected to the submarine, and the crew can send commands to the torpedo, such as turn left or right, change depth, or other commands that will enhance the torpedo's probability it will detect the target. - Mod 6, which is referred to as the “legacy” Mod, since their G&C’s are built with MILSPEC parts. - Mod 6 ACOT, where the ACOT G&C is an exact replacement for the legacy Mod 6 G&C using Commercial Off-the-Shelf (COTS) components. - Mod 7, which is a Mod 6 ACOT with a Broadband Signal Amplifier Receiver (BSAR) instead of a discrete signal receiver, which gives the Mod 7 more capability. 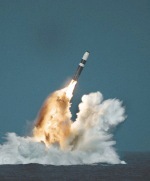 Submarines can also launch Tomahawk land-attack missiles. All fast attack submarines can launch Tomahawks from their torpedo tubes, and most of the Los Angeles Class (688s) have 12 vertical launch tubes in their bow. The first flight of Virginia class submarines lack vertical launch Tomahawk capability, but the next two flights of Virginia submarines will have the capability. However, unlike the individual launch tubes like you see in the photo of the Los Angeles class submarine, the current plan is for the Virginia class to have two large 6-canister tubes in the bow, similar to what the SSGN carries in its Missile Compartment. - SSGNs (guided missile submarines) can also launch Tomahawk torpedoes, with 22 of their 24 tubes capable of launching 7 Tomahawks each, for 154 total, depending on how the SSGN is configured. SSBNs (ballistic missile submarines) can carry up to 24 missiles, which can be configured with up to 8 nuclear warheads each. Depending on the warhead, each warhead can be about 25 times more powerful than what was dropped on Hiroshima, so you can imagine the destructive power of a single TRIDENT ballistic missile submarine. Although not exactly "armament", SEALs are pretty effective weaponry and after torpedoes, Tomahawks and D5 missiles, the most lethal delivery a submarine can make. Some fast attack submarines had the capability to conduct Dry Deck Shelter operations (more on that tomorrow), but I think none of them do today, which leaves fast attacks with simply "lock-out" capability, which means the SEALs simply exit and enter the submarine from the submarine's hatches while underwater. The submarine gets close to shore, drops off the SEALs, then loiters in the vicinity until the SEALs return from their mission ashore. SSGNs can carry two Dry Deck Shelters (DDS), 9-foot diameter chambers attached to the top of the Missile Deck. Each DDS has the ability to carry one SEAL Delivery Vehicle (SDV) or several RIBs (inflatable speedboats - more on that tomorrow). But normally, DDS's carry SDVs. 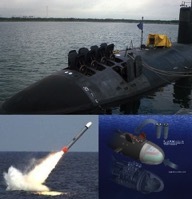 An SDV is a 4-man mini-sub capable of being launched from the DDS while the SSGN loiters off the coast submerged. 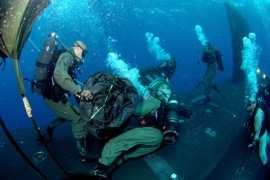 The team of SEALs traverses toward shore submerged in their SDV, returning when their mission is accomplished. As I mentioned in my last post, RIBs are inflatable speedboats that SEALs attach motors to. These RIBs can be stored in various locations aboard submarines - in Dry Deck Shelters, in converted missile tubes aboard SSGNs, or in the submarine's superstructure lockers. - SSGNs also have one of their Missile Compartment levels converted into extra berthing, so they can carry 2 platoons of combat SEALs. The 2 platoons of SEALs can exit the submarine, retrieve and inflate their RIBs and attach their motors, and be heading to shore within minutes. - Noisemakers that try to deafen the incoming torpedo, so it can't hear (detect) the submarine as it tries to evade. - Decoys that try to mimic the acoustic signature of the submarine and convince the torpedo to follow it instead of the submarine trying to evade. The combination and sequence of countermeasure employment is classified, so unfortunately, in The Trident Deception, I simply referred to "countermeasures" as torpedo "decoys" in general, without stopping to explain the differences between the various types or their employment. 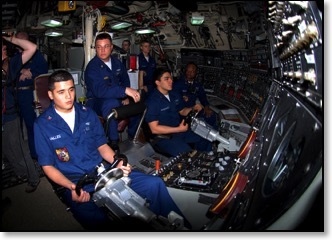 Welcome to Topic 4 of Submarine 101 - Submarine Crews! - 4 department heads: the Engineer Officer or "Eng", responsible for the nuclear reactor, the propulsion plant, and all basic mechanical and electrical systems, the Navigator or "Nav", responsible for the navigation and radio divisions, the Weapons Officer or "Weps", responsible for the submarine's torpedo, sonar, and missile divisions, and the Supply Officer or "Suppo", although many have not broken the habit of calling the man responsible for serving the pork and beans, "the Chop". - The rest of the officers are junior officers on their 1st submarine tour. There's also a Medical Department headed by a Corpsman, and I'll talk about that at the end in the section titled "When Things Go Wrong." Unlike fast attacks, SSBNs and SSGNs have two crews (Blue & Gold) to maximize the time the boat spends at sea. - While one crew is at sea, the other crew takes on replacements for personnel who have transferred or left the Navy, then trains and certifies the new strategic, navigation, and tactical teams in training centers ashore, and also gets some well-deserved time off with the family. - Once the boat returns, both crews work together during its "Refit" period before the other crew departs on patrol. In 2010, the Navy finally decided to allow women to serve on submarines, and admitted the first dozen female officers into the nuclear power training pipeline. - The argument against women on submarines (as I understand it) has been the difficulty of accommodating them due to privacy concerns (no separate berthing or bathroom facilities) and radiation concerns (to the unborn child before you know you are pregnant). However, those concerns have apparently been addressed and the barrier removed. - The first female officers will be stationed aboard Ohio class SSGN and SSBNs, and also on select Virginia class submarines. 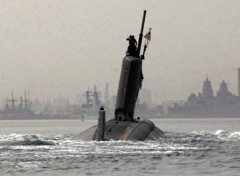 - As a note, this is not something new to submarines - just the U.S. Navy. Foreign navies have had women serving aboard their submarines for decades in some cases. For any upset bubbleheads out there, my favorite quote I've heard to date is: "Easy guys - we let nukes aboard. Women should be easy." P.S. For non-bubbleheads, nukes = nuclear trained personnel. 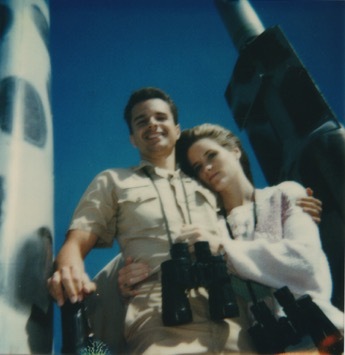 Speaking of women on submarines, below is a photo of my wife and me, atop the sail of USS Kamehameha in 1994, while underway for a Dependents Day cruise. Welcome to Topic 5 of Submarine 101 - Deployment Info. I'll start with the basics - how long do submarines go on deployment? Ballistic missile submarines (SSBNs) have about a 100 day cycle - a 2 and 1/2 month patrol followed by a 1 month in-port "Refit", or maintenance period. SSBNs have 2 crews, and both crews assist with the Refit, then one crew will spend the next 2 and 1/2 months in port while the other crew is at sea. - Fast attacks (SSNs) typically have an 18 month cycle, during which they deploy for 6 months. - Guided Missile submarines (SSGNs), like SSBNs, have 2 crews and conduct a deployments similar to a fast attack, although the missions are different. 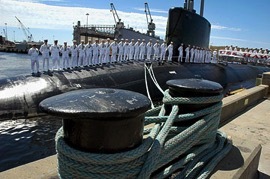 Once submarines return from deployment or patrol, the crew usually gets some well-deserved time off, personnel transfer and replacements arrive, and the crew begins the process of training and melding back into a finely tuned team. Prior to patrol or deployment, the crew is certified by Squadron or Group personnel, typically during monitored scenarios in team-trainers ashore: Navigation, Tactical (Fire Control Party and Sonar), and EAM (Emergency Action Message - i.e. 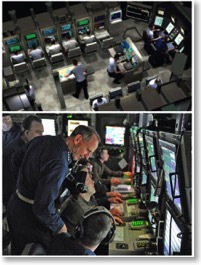 nuclear weapon launch order decryption teams) and the Strategic Command and Control Team, for example. - Each formal team trainer is usually a week long evolution, although the crew can get extra time if it appears they need it. Submarines operate in a harsh environment - seawater is very corrosive and the submarine operates at depths where it is subjected to extremely high pressures. A submarine is a complicated ship with thousands of pumps, motors, generators, turbines, and valves, etc, that have to be kept working properly. 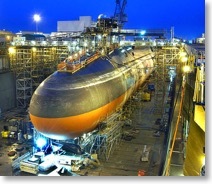 - When not on deployment, about once a quarter, each submarine enters an Upkeep (fast attack) or Refit (SSBN/SSGN) maintenance period, which lasts about four weeks, during which the submarine is repaired to full capability. - After the maintenance period, the submarine goes to sea for what's called "sea trials" where it tests out the repaired systems, which normally includes a controlled dived down to test depth. 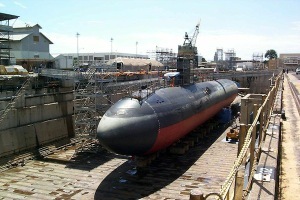 - Submarines don't normally enter drydock for their quarterly maintenance - it's normally done pierside. But every so often they enter drydock for more extensive maintenance. Prior to deployment or patrol, the submarine loads everything it needs for its 2 and 1/2 month patrol or 6 month deployment: its weapons, food, spare parts, diesel fuel, and tops off its water tanks. 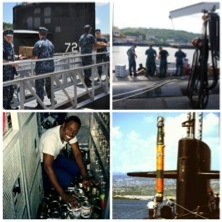 - On older ship classes, the food has to be loaded manually, box-by-box as you see in the top two photos of the post, while on TRIDENT submarines (Ohio class) there are removable 8 foot diameter (about) Logistics Escape Trunks that allow the food to be pre-loaded into their supply room containers, then lifted by crane and lowered into the submarine and slid and locked into place in the supply storage room. A whole lot easier. - I'll provide more detail about the food loadout when we get to the Food section in Topic 8. There are a lot of arrangements to be made before you depart for patrol or o deployment. The simplest is the packing - the clothes you'll need, plus personal articles (toothpaste, etc. ), maybe a few books, plus pictures of the family. - You'll also have to make arrangements for everything you'll miss while you're gone. You'll write letters to your wife that she can open once a week, and you can write stickies or notes you'll hide around the house for her to find while you're gone. 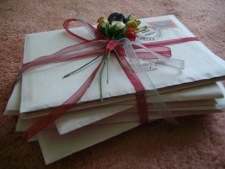 - Don't forget the special holidays you'll miss while you're gone, so you'll have to pre-order the Valentine's and Mother's Day flowers, and buy and wrap the birthday and Christmas gifts, and don't forget the cards either. Being on deployment or patrol is difficult on the family, and it'll be hardest on the kids while you're gone, especially when they're young, so you'll leave special pictures for them to carry around with them, or sometimes you'll make a video they can watch on TV. - You can also write notes ahead of time that your wife can put inside their lunch box or bag periodically while you're gone. - This is a picture my oldest daughter carried around with her every day for an entire patrol. Welcome to Topic 6 of Submarine 101. After 5 lessons of the basics, we're finally ready for what you've probably been waiting for - we're getting underway! The first thing you'll notice is that the submarine isn't that stable on the surface. That's because it's got a round hull, while surface ships have a nice deep keel to keep them stable. It rolls quite a bit on the surface in rough weather, so we can't wait to get into deep water and "pull the plug". - Once we're in deep enough water, the Captain (although his rank is a Commander except on SSGNs) will give the order to submerge the ship (lots of preps before that but can't cover them here). The Main Ballast Tank (MBT) vents will be opened, allowing air to escape and water to flood up through grates in the keel, and the sub will gradually sink into the ocean. - The "Compensation" is critical. After a submarine is in port for a long maintenance period, supplies and spares are loaded, and diesel fuel and water are topped off, etc. It can be difficult to estimate the exact weight of the submarine. This estimation and adjustment back to neutral buoyancy is called "The Compensation", and it's critical to get it right. If the submarine is too heavy, once the air escapes from the MBTs, the sub will continue to sink toward Crush Depth and the crew will have to "catch and carry the extra weight" with speed and ship's angle until the extra weight can be pumped off. If the sub is too light, is won't sink at all (not dangerous but professionally embarrassing). 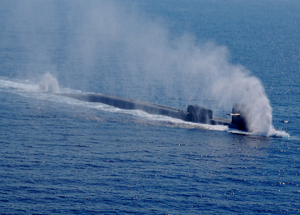 - The photo in the post is of an SSGN submerging, venting its MBTs, What looks like smoke is simply water spray, being blown upward by the air escaping from the MBT vents, fore and aft. A submarine's course is controlled by its rudder, just like a surface ship. Its depth is controlled primarily by putting an angle on the ship, then "driving" the ship up or down through the water. This angle is put on the submarine by its Stern Planes, mounted on the back, or stern of the ship, near the rudder. - The ship's depth can also be fine tuned by another set of planes called the Sail Planes or Bow Planes, depending on the submarine class. Older classes - 688 1st Flight and Ohio Class (SSBN) - have Sail Planes, while newer classes have Bow Planes. - Bow Planes provide more maneuverability, but the Navy resisted moving the planes closer to the sonar sphere in the bow due to the mechanical noise associated with moving the bow planes around, but advances in technology allowed the development of quiet bow plane mechanisms. One of the most critical routine evolutions aboard a submarine is going to periscope depth. A submarine is never 100% sure what's on the surface because it only knows what it can hear. Sailboats, quiet warships, fishing trawlers with their engines idle, etc. will go undetected, for example. - Also, when a submarine comes shallow, due to the ocean's thermal layer, it will often pick up new contacts - sometimes dozens, and have insufficient time to determine each one's course, speed and range before it much come up to copy the radio broadcast or transmit a message. The submarine's crew must simply convince themselves that none are close enough to pose a collision threat during the ascent to periscope depth. - During an ascent to periscope depth in a high contact density environment, it can be quite tense in Control, and protocol during all ascents to periscope depth is that there is no talking in Control, aside from the Diving Officer's depth reports, from the time the Officer of the Deck gives the order to proceed to periscope depth, until the periscope breaks the surface of the water and he announces "No close contacts", or gives the order "Emergency Deep". Prior to surfacing, the submarine will proceed to periscope depth and take a look around to ensure there are no surface ship contacts that pose a collision threat while surfacing. If everything's clear, the crew will use the submarine's stern planes and speed to drive the submarine as high out of the water as possible, then start the submarine's Low Pressure Blower, and start blowing the water out of the Main Ballast Tanks (MBTs). - Once the water has been blown out of the MBTs, the submarine is firmly on the surface and the submarine can slow down and its stern planes can be repositioned and locked into their surface running mode. - An alternate method of surfacing, used in an emergency, is the Emergency Blow. In this case, switches are actuated in the submarine's Control Room which open valves that port 4500 pound air to the MBTs, forcing the water out of the tanks, making the submarine lighter very quickly. The submarine races to the ocean's surface, like a cork held deep underwater and then released. Underwater Ops - How do you know where you are? As I mentioned in the Sonar Room post, submarines are blind underwater, and know what's going on around them only from what they hear. So how do they know where they are as they drive around for months on end? - A couple of ways. They can go to periscope depth and obtain a GPS fix from satellites in orbit. But a submarine's primary means of navigation between fixes are its "inertial navigators". Two identical complicated machines that measure small changes in gravity to figure out in which direction the submarine is moving. These updates are fed to a navigation chart and compared to each other. As long as they're both tracking together, life is good. - The photo in the post is a cutaway of an older inertial navigator. 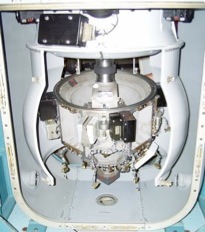 These devices use small beryllium balls spinning around at thousands of revolutions per second, and variations of these navigation devices are also used on missiles. If you've heard the term ' "spinning up all missiles" as they're brought on-line for launch, it's a reference to their inertial navigators "spinning up" their beryllium balls. It's so much easier to file a missile than it is to fire a torpedo. Two sweeps of the radar - mere seconds - and you've got a target solution. Send it to the missile and fire. 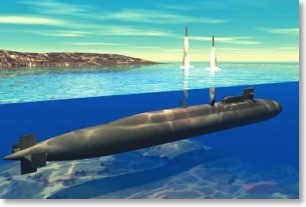 Not so easy on submarines - it can take HOURS before a submarine is ready to launch a torpedo. Why the difference? Range. 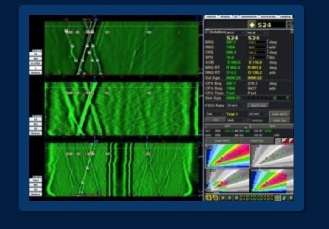 - The big difference between radar and sonar is range information. Radar delivers both bearing and range information. Submarines however, normally use passive sonar, which provides only bearing information. As a result, when a contact is gained, you know what bearing it's on, but you don't know how far away it is, its speed, or its course. It could be a mile away heading east, or ten miles away heading west. So you can't shoot - just yet. You need to figure things out. - Fortunately, you can. There are ways to evaluate a contact's bearing and eventually determine its range, course, and speed. But it takes time. And if it maneuvers to a new course and speed while you're trying to figure it out, it makes it that much harder. When two submarines engage in a cat-and-mouse game hunting each other, each one constantly changing course and speed, it can be a nerve-wracking and time-consuming ordeal until one submarine crew decides they have a firing solution. Welcome to Topic 7 of Submarine 101! Now that we're underway and you've got the hang of how the submarine maneuvers and tracks contacts, we'll settle into the daily routine. First up - The Watch Cycle. Submarines operate on a 6 hour "watch" cycle. The crew is divided into 3 "watch" sections, and each section stands watch for 6 hours, then gets 12 hours off. During those 12 hours off, a crew member eats, sleeps, trains, and conducts maintenance. As a result, the crew operates on an 18, vice 24 hour day. However, the submarine, and senior enlisted and senior officers, remain on a 24 hour schedule, which causes a bit of havoc with the crew's biological clock. - For example, if a section has the Midwatch (midnight to 0600), they'll get off and eat breakfast, then most likely have drills on the morning watch, training on the afternoon watch, then back on watch for the evening watch. So - they'll often be up for 24 hours straight without sleep, every third day. They'll try to catch an hour or two down here or there, but sometimes can't, depending on the ship's schedule or real-world ops. I mentioned drills during yesterday's post, and submarines run a lot of them. Engineering drills, Ship drills, and Fire Control Party drills. Drill after drill, with the crew combating a never-ending affliction of things going wrong. In the Engineering spaces, the "nukes" - nickname for the nuclear-trained personnel - run drill after drill combating casualties that take down or cripple the reactor or propulsion plants, restoring them to full operation as quickly as possible. - Ship wide, the crew runs flooding and fire drills, torpedo "hot run" and other emergency drills when at Battle Stations, attempting to anticipate every type of malfunction or battle damage than can occur during combat. When you're not running drills during normal working hours, odds are you'll be studying something, whether in a formal classroom style lecture on reactor plant theory for the nukes during department level training, "in-rate" topics for the divisions during division level training, or hours upon hours of self-study as you qualify first one watch station, then another and another, or learning practically every piping run, valve, and switch on the submarine as you qualify in submarines and earn the right to wear the silver or gold "dolphins" on your chest. - Then there's the advancement exams you'll be studying for so you can get promoted if you're enlisted, or qualify as Engineer or for Command if you're an officer. The studying never ends. Never-ending maintenance. A submarine is incredibly complex with a lot of equipment, and a certain percentage of it always breaks. So pretty much every evening, real-world ops permitting, each division sets aside time for "Corrective" maintenance - fixing the stuff that's broken. Luckily, submarines have a lot of redundancy and can function with broken equipment while it's being repaired. 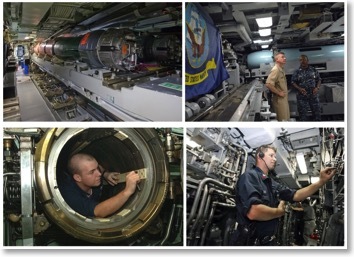 - Navy ships also have a maintenance philosophy called "Preventative maintenance", where equipment is "maintained" according to a set schedule. Sorta like taking your car in for an oil change every 15,000 miles. A good portion of a crew member's 12-hour "off time" is dedicated to maintenance. When you're not doing drills, training, maintenance, or studying, you might be able to squeeze out some time for relaxation. Normally that'd be every third day, coming off the afternoon watch, when you've got the evening and mid-watch off. Is there time to work out on a submarine and the equipment to do so? - If the submarine's operational situation permits it (the risk of you dropping a weight or otherwise clanking around), a crew member will typically work out after they come off watch or before they go on. There won't be much equipment on board however. There's no standard equipment either - each submarine jams whatever they think they can fit aboard - typically one or two stationary bikes, maybe a rowing machine, a versa-climber, sometimes a treadmill. Some of the SSBNs, which have more room, have a universal style weight machine, and a lot of submarines will have a work bench with adjustable dumb bells, maybe a weight bar. Everything is focused on cramming as much utility into as little space as possible. The Daily Routine - Sledding, Anyone? 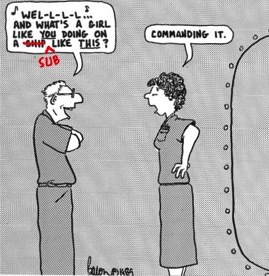 Okay, so submariners are still Big Kids, looking for ways to entertain themselves. When operations permit and the submarine is making depth changes with a steep angle - and assuming they been given a head's up and have the proper equipment (although it doesn't take much, as you can see in the photo) you can go sledding on a submarine. - Submarines use a plasticy insulated flooring in some of its compartments, which is somewhat slick, and with a steep enough angle and the right "sledding" equipment, you can get up a pretty good head of steam. - The tricky part isn't getting going though; it's stopping once you reach the far bulkhead. Welcome to Topic 8 of Submarine 101! By now you're probably hungry, so we finally get to the topic of - Food! What's the food like aboard submarines? We'll start with - The Loadout. Due to space limitations, many items are baked aboard the submarine rather than brought aboard already made. There's a Night Baker assigned to bake the white bread needed for sandwiches and toast, along with dinner rolls, hamburger and hoagie buns, and all the pastries, cakes, and cookies. And nothing tastes better than pies and cookies right out of the oven. Submarine Food - The Menu and the "Meat Identifier"
Submarines serve 4 meals each day - breakfast, lunch, dinner, and mid-rats, so that each watch section can eat either before or after watch. - As I mentioned, the menus are on a rotation, and each main course (chicken, pork, steak, etc.) is usually paired with the same side dishes. For example, if you walk into the Wardroom and see applesauce on the table, you know you're having pork for dinner. Applesauce in this case is - the "Meat Identifier". The 1st thing you'll run out of while underway is fresh fruits and vegetables. You'll notice that when the salads disappear. Submariners look forward to port calls not just for the liberty, but for fresh veggies and milk! In the old days, the milk would go next, replaced by powdered milk (yuk! 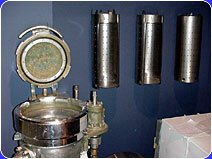 ), but nowadays submarines carry irradiated milk, which lasts much longer. - What? 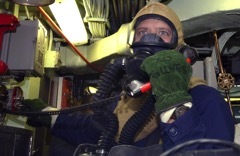 Submariners afraid of irradiated milk? C'mon. Officers and enlisted eat separately. The enlisted eat in the Crews Mess while the officers eat in the Wardroom. - The Crews Mess is cafeteria style - grab your tray and utensils and pick out the food you want, then sit down wherever you want with your buddies, as you can see in the top two photos. 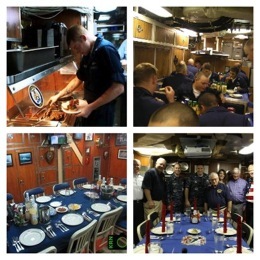 - The Wardroom is much more formal, as you can see in the bottom two photos. The officers are seated by seniority, with the Captain on one end of a rectangular table that seats 12 and the Supply Officer on the other end. No one sits until the Captain sits, then each course is brought out individually (soup, salad, main meal, dessert/coffee), and no one begins eating each course until the Captain begins, and no officer may leave the table unless he is excused by the Captain. The only exception is the 2 on-coming watch officers may eat ahead of the Captain, as they need to eat quickly so they can relieve the watch, and the two off-going watch officers eat at "second-sitting". 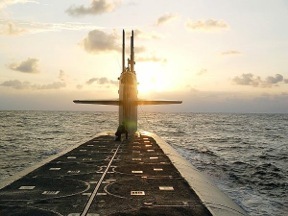 What's the most critical piece of equipment aboard a Nuclear Powered Submarine? - Some will say it's the nuclear reactor that provides power, others will say it's the torpedo tubes so they can defend themselves, and others will say it's the main engines that carry them to safety. - Nope. The most essential piece of gear aboard a nuclear powered submarine is the ice cream machine. - Submarines have a soft-serve ice ceam machine that typically serve vanilla or chocolate ice cream (whatever mix they happen to have), and that's one piece of critical gear that better stay working the entire deployment or patrol. Submarine Food - What do you do with the Garbage? Garbage is segregated into 2 categories - biodegradable and not. The stuff that will decompose gets compacted into the metal cans you see hanging from the wall, and dropped out through the TDU - Trash Disposal Unit - on the left, which is about a one-foot diameter hole in the bottom of the submarine. - The stuff that isn't biodegradable (i.e. plastics), gets cleaned up and stored until the submarine returns to port. Submarines - A Tasty Snack? I wasn't sure where to put this post, but it's too fun not to include somewhere. 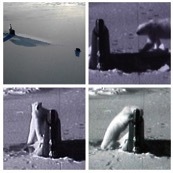 This happened on an ICEX, where a submarine surfaced near the North Pole (top left photo). A polar bear took notice, and apparently decided the submarine looked like a tasty snack, and tried to take a bite out of the rudder. 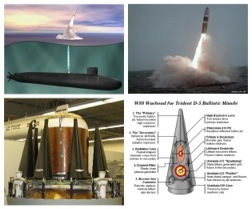 Life Aboard Submarines - Water, Water, Everywhere & Not a Drop to Drink! Welcome to Topic 9 of Submarine 101! Earlier I introduced you to submarine food. Now it's Water (and Air). I'll start with - Water. Submarines have to make all the water they need - for drinking, cooking, bathing, and most important (aside from drinking) - the propulsion plant. - Drinkable water, and even purer water for the propulsion plant, is created by a submarine's evaporator - basically a tea kettle that boils the seawater and condenses the steam into pure water. However, evaporators have been replaced with new Reverse Osmosis machines, which filters out the impurities in the seawater. - But submarines can make only so much water per day and water supply is limited, so water faucets are designed to shut off after a few seconds, and the crew is trained to take "submarine showers", as I mentioned in Topic 4. Submarine Air and Water - Where does the oxygen you breath come from? The answer is - submarines make their own oxygen. - Submarines have one or two oxygen generators (depending on the submarine class) that break water molecules into their oxygen and hydrogen atoms. The oxygen atoms combine to form breathable oxygen (O2), and the hydrogen is pumped overboard. - Submarines also store oxygen in oxygen banks for an emergency in case both oxygen generators go down, or if the submarine sinks and loses power, they can bleed oxygen from the banks. Submarine Air and Water - Carbon Dioxide "Scrubbers"
Submarines have Carbon Dioxide "Scrubbers", which remove the carbon dioxide humans exhale, from the submarine's atmosphere. - There are lots of other impurities in a submarine's atmosphere besides carbon dioxide which must be removed (besides the smell of your buddy's socks and sneakers). In addition to Carbon Dioxide Scrubbers, submarines also have Hydrocarbon "Burners", which remove lots of other impurities from the air. The older the submarine, the funnier the smell. If it's a diesel submarine, it'd be a diesel smell, but the U.S. doesn't have any diesel submarines any more. So what's that smell? It's most likely amine, a chemical we use in the Carbon Dioxide Scrubbers to remove the carbon dioxide from the air. Between the Scrubbers and Burners removing CO2 and other impurities from the air, you don't end up smelling like your buddy's socks, but you do end up smelling like amine. Submarine Air and Water - Smoke Break? When I joined the Submarine Force, smoking was still allowed on submarines and even on watch. But that gradually changed, and in 2010, smoking was completely banned aboard submarines (below decks). Welcome to Topic 10 of Submarine 101! Here I'll run you through the training and certifications submarines go through. The best type of training a submarine can get is "sub on sub" - two submarines going head-to-head against each other, attempting to detect and simulate shooting each other, and in some cases actually shooting Exercise torpedoes. - In these cases, one submarine will be restricted to operating shallow with the other one deep, so that they don't run into each other if they happen to cross paths. Submarine Command Courses (SCC) are for officers tapped to become the next submarine Executive and Commanding Officers. These classes convene once a quarter and last 3 months (plus an additional 3 months of refresher reactor plant training for the prospective commanding officers). - SCCs culminate in a weeklong exercise at sea, with the class of PXOs and PCOs split between 2 or 3 submarines with their torpedo rooms loaded to the gills with exercise torpedoes, going head-to-head day and night. 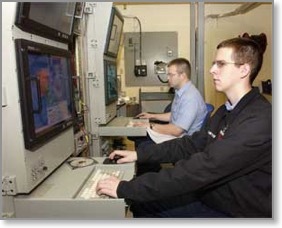 Safe operation of the nuclear reactor is paramount, and the crew is examined annually by an external inspection team, assessing the reactor plant's material condition and the crew's knowledge and their ability to conduct maintenance, routine evolutions, and respond to reactor and propulsion plant casualties. - There's a lot of teamwork involved in the proper operation of the reactor and propulsion plant, and the workup for the inspection can be grueling. The photo is a T-shirt one of the 3 watch sections created during the workup for an ORSE when I was the Engineering Officer. Submariners can be somewhat cynical, as the T-Shirt depicts the section failing the inspection in epic fashion, blowing the ship up during the ORSE. Of course, submarine nuclear reactors can't actually blow up. - The T-shirts were worn hidden beneath their blue coveralls, and the watch section did fantastic. 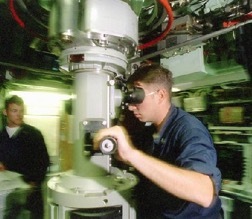 While an ORSE (Operational Reactor Safeguards Examination) is focused on the safe operation of the reactor and propulsion plant, the TRE is focused on the crew's state of tactical training and its ability to successfully complete all of its tactical and strategic missions, including engaging another submarine or surface ship in battle, launching its ballistic or Tomahawk missiles, conducting surveillance off the coast, or launching and retrieving SEALs, etc. - all while combating various casualties - fire in the case of this photo. 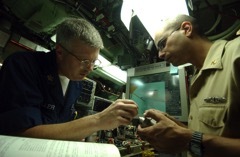 While other inspections are focused on the crew's ability to safely operate the nuclear reactor or engage in combat, the Supply Management Inspection (SMI) evaluates the Supply Department's ability to support the submarine in a number of areas - adequate spare parts on board, and first and foremost - good food. Also, each year, the ship (surfaced or submarine) with the most outstanding galley is awarded the Ney Award. The two biggest threats to a submarine are flooding and fire. Unlike surface ships with lots of compartments, if a single compartment gets flooded on a U.S. submarine (aside from the Reactor Compartment), the submarine is going to the bottom. The compartments are simply too large and even with an Emergency Blow, there isn't enough reserve buoyancy. So stopping any flooding quickly is crucial. - Fire is the next most dangerous hazard, as the submarine is a closed environment, and the compartments fill up quickly with toxic gases and thick black smoke. The fire can spread rapidly, destroying vital equipment. - So the crew trains constantly, both ashore and at sea, honing their skills against these two casualties. 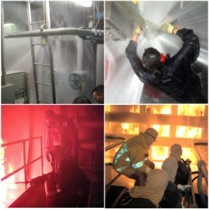 Here you see pictures of shoreside Flooding and Fire trainers, giving the crew hands on experience they can't get while on board the submarine. Welcome to Topic 11 of Submarine 101! Here I’ll cover some submarine rituals and other fun stuff! - Another auction determines who serves the food in Crews Mess and the Wardroom, and cleans up afterwards. Typically a few officers will get tagged with this "honor". - Another auction will determine which enlisted will get to eat in the Wardroom, or even sit in the Captain's chair, or even be the "Captain for a day". - All-in-all, Halfway Night is a time for the crew to let down their hair and break through the formality barrier between officers and enlisted. It's a fun night, and everyone looks forward to it. A Shellback is a sailor who has crossed the equator on a naval vessel. 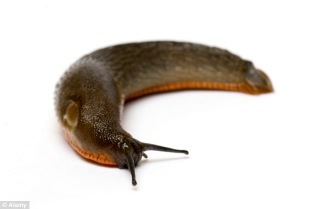 A Pollywog is someone who has not. You don't want to be a Pollywog when you cross the equator, because then you'll get to be initiated and become a Shellback. - It's all in fun and the ceremonies used to be pretty gross, but they've been toned down over the years. But basically the fattest guy on the crew becomes King Neptune for the day, appropriately regaled with crown and scepter, and Pollywogs have to pay homage and do his bidding, appropriately supervised by Shellbacks who have thought up some pretty interesting events, which may or may not include sucking a cherry out of King Neptune's belly button. - Crossing the equator and becoming a Shellback is not only a submarine tradition, but a surface ship and an international Navy tradition. I couldn't find any good (i.e. 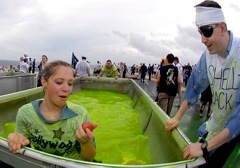 appropriate) submarine photos, so here's one from an aircraft carrier, where it looks like the Pollywog had to dive under the "slime" and pick up the "apple" with her mouth. A Blue Nose is a someone who has crossed the Artic Circle. There aren't too many Blue Noses in the Submarine Force, since submarines go up under the ice infrequently - every few years, 2 or 3 subs will go under the polar ice cap to shoot torpedoes, or submarines will transit under the polar ice cap if they're doing an inter-fleet transfer and the decision is made to send them under the ice rather than through the Panama Canal or through the Suez Canal. - Blue Nose rituals will involve the pre-Blue Nose somehow getting really cold and getting a blue nose. Although it's not really a ritual, passing through the Panama Canal is a unique experience you'll never forget. I got to do it twice, first as Junior Officer of the Deck, and again as Officer of the Deck, on the Bridge guiding the submarine into the Gatun Locks from the Atlantic Ocean. - The Panama Canal is above sea level, so the locks raise the ships up in stages, then the ships transit across the picturesce countryside through canals with steep, sloping cliffs, which connect various lakes, until you reach the Miraflores locks, which lower you down to the Pacific Ocean. 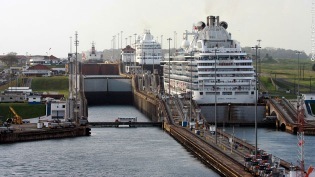 - The maximum width of almost all ships is dictated by the width of the Panama Canal. In the photo you can see several cruise liners in the canal, and what a tight fit it is. 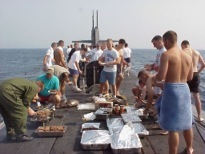 One of the "rituals" submariners look forward to is a Steel Beach Picnic. When operations permit and weather cooperates, the Captain will surface the ship and the crew will have a cookout on top of the submarine. - The cooks will bring a Bar-B-Q grill topside, grill some burgers and hot dogs, and the crew will kick back and relax. 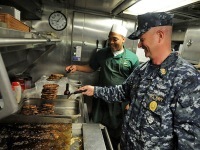 The cooks will even send up some burgers and dogs to the Officer of the Deck and Lookout, stationed on the Bridge. What would a Steel Beach Picnic be without a - Swim Call. Typically, when the Captain surfaces the submarine for a Steel Beach Picnic, he usually authorizes a Swim Call. Break out the sunglasses, because a bevy of pasty-white submariners will head topside to catch some rays and dive into the water, including from the sail planes on the older submarines (one drawback of shifting to bow planes). - One note: we're always on the lookout for sharks, so we post an extra lookout in the Bridge with a rifle. The joke is - he's not there to shoot the shark, just the farthest guy out, so the rest can make it back. Welcome to Topic 12 of Submarine 101! This is a fun topic - Submarine Pranks! - So Deck Division, who normally has the newest recruits assigned, will select an unfortunate soul for the duty, and have him dressed in foul weather gear, life preserver, deck harness, boat hook, etc, ready to head topside, and send him to the Control Room to request permission to head topside to retrieve the mail buoy. The Officer of the Deck will of course, decline permission, since there is no such thing as a mail buoy. - From the cartoon I found, apparently the Mail Buoy prank is a surface ship as well as a submarine prank. Another submarine prank involves "Bearing Grease". 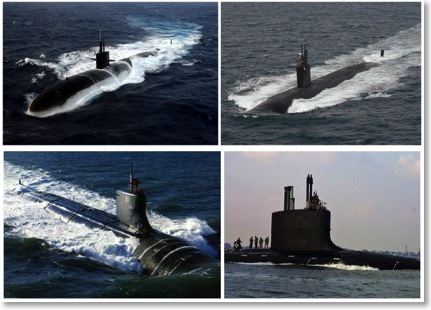 There are lots of physical bearings on submarines - main engine bearings, shaft bearings, etc. and a lot of them need to be greased. There are also "directional" bearings - True and Relative, with Relative being a contact's bearing in degrees off the ship's bow rather than from true North. - The prank on a new seaman is - his division is doing maintenance, and the Chief will send the seaman to the Supply shack for grease for the "Relative Bearing" they're about to install, and he needs to hurry so he doesn't hold up the maintenance. So the seaman hustles to Supply, where the Supply Chief will check, and sure enough, he'll be out of "Relative Bearing" grease. But he issued the last batch to Machinery Division in the Engine Room - the seaman should check with them. So the seaman scurries to Shaft Alley only to find out that M-Div used the last of their Relative Bearing grease that morning. But M-Div says that Torpedo Div near the bow has some. So the seaman hustles to the front of the submarine and checks with Torpedo Division, but alas, they're all out too. But they think A-Div might have some. And so it goes, the seaman bouncing around frantically searching for Relative Bearing grease, knowing his Chief is waiting for it, until he finally figures out there is no such thing as a "Relative Bearing" or someone eventually clues him in. Submarines typically exercise their torpedo tubes once each week to make sure they're operational, filling them with water and firing them. This is called "shooting water slugs". On older submarine classes, the tubes are fired with 3000 pound high pressure air, and it's pretty loud. Before firing the tubes, an announcement is made - "Shooting water slugs." - Another submarine prank is to hand a bucket to a Seaman and tell him to head to the Engine Room and get a bucket of "water slugs" from the bilge (back when we had wet bilges). The chief would explain how the little creatures get into the bilges from pump drains and grow, and they have to shoot them out the torpedo tubes. The Seaman would head to the Engine Room, bucket and scoop in hand, where, of course, there are no water slugs in the bilge. The Executive Officer, or XO, is the Captain's right-hand man and the officer responsible, along with the Chief-of-the-Boat (COB), for running the ship. As such, he can be a slave-driver at times, and he can be somewhat unpopular. - The military officer-enlisted relationship requires the crew follow his orders and show the proper respect, but on patrol or deployment, the crew will sometimes pull a prank on the XO. One of those pranks is to remove the hinge pins and steal the XO's stateroom door for a while. 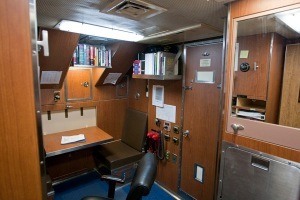 - I couldn't find a picture of an XO's stateroom - this one looks like a fast attack Commanding Officer's stateroom. The metal thing to the right is a fold-down sink, and above it is a medicine cabinet. You see a fold-down table with one of two seats at the back of the stateroom. The table folds up, and the Captain's bed then folds down from the bulkhead. Another prank a submarine crew will play on the XO is the mysterious flickering light. This will typically involve an electrician, of course, who will tap into the XO's stateroom light, connecting it to either a toggle switch or a communication circuit somewhere. The XO's light will flicker or malfunction and the XO will call an electrician who will check it out. But of course, every time he checks it out, it works perfectly. And every time anyone is in the XO's stateroom, it works fine - the only time it malfunctions is when the XO is alone, and everyone starts to think the XO is wacky. This is a prank pulled on someone who is standing Diving Officer of the Watch in the Control Room, who is responsible for maintaining a desired "trim" on the submarine - the angle the boat would steady up at if the planes were put in neutral. i.e. if the submarine is too heavy forward, the boat will have a slight down angle, and you can pump water between the Forward Trim and After Trim tanks (and tanks in between) to evenly disperse the weight aboard the submarine so that at all stop, the submarine is at an even keel. 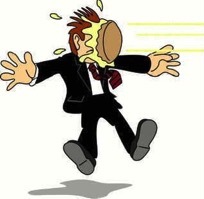 This prank is typically pulled on someone who is trying to qualify Dive and is being observed in his final qualification watch. One to two dozen guys will get together and head to Shaft Alley, the furthest point aft in the boat you can go, and just when the Dive thinks he's got an even trim, someone in Control will call back and everyone will run to the bow, totally screwing up the weight distribution. The Dive will pump water aft to compensate, and just when he thinks he's got it under control, they'll all run back to Shaft Alley. Submarine Pranks - A Little Bit Off Course? This isn't really a submarine prank, per se, but I ran across this and thought it was pretty neat. Someone put a lot of work into this prank, making it appear like a submarine went to periscope depth from underneath the city and crashed up through the sidewalk. Welcome to Topic 13 of Submarine 101 - Unusual Operations! 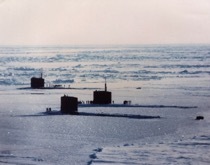 Submarine combat under the polar ice cap is a challenging scenario, since submarines use sound to detect their adversary, and the sound bouncing off the polar ice cap above complicates things. Plus, it's a hazardous environment, with deadly ice keels jutting downward, which can puncture and sink a submarine if they are run into at high speed. - Additionally, the near freezing temperatures place submarine weapon systems in unusual circumstances where they might not work. For example, I was at a base camp on the polar ice cap in 2009 and I pulled out my camera to take a picture, and it didn't work. The camera was so cold, the battery didn't function. I had to put the battery inside my thermal suit for a while to warm it up so it would work. - Every few years, the Navy sends submarines under the polar ice cap to shoot exercise torpedoes at each other, to ensure they retain the tactical ability to prosecute enemy submarines under the ice, and to verify their weapon systems function in the harsh polar environment. End-to-end testing of warshot torpedoes is essential, to verify everything works properly, so each year 1 to 4 Heavyweight torpedoes (fired by submarines) and 1 to 2 Lightweight torpedoes (dropped by helicopters or P-3/P-8 aircraft, or fired by surface ships) are tested. - One interesting fact is that when fired against surface ships, Heavyweight torpedoes don't puncture the ship - they explode beneath the keel, and the void of water the explosion creates breaks the ship's keel, since there is nothing under the ship to support it, and the ship breaks into two pieces, as you can see in the photo. Like a Warshot torpedo live firing, an FCET is a ballistic missile live firing, except the nuclear warheads are replaced with instrumentation to measure flight and impact coordinate performance. - Each year, the Navy performs an FCET, launching multiple missiles from an Ohio class ballistic missile submarine, verifying the submarine's weapon and launch systems, as well as verifying the missiles work properly. Whenever a new torpedo or software is developed, the weapon must pass thorough Developmental and Operational Testing (DT/OT). 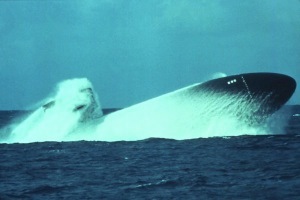 - Exercise torpedoes are prevented from hitting other submarines by "STRATUM" protection, operating in a different layer of the ocean, or in older variants, by a "turnaway" feature. But DT/OT testing often calls for "Set-to-Hit" shots against special targets to verify the final phases of torpedo homing, arming, and detonation (with fake warheads). 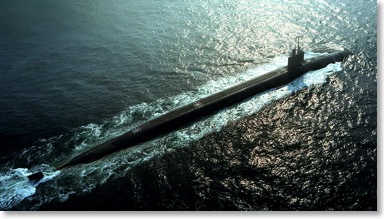 Submarines do a lot of Sub-on-Sub training, honing their skills to locate, track, shoot, and evade other submarines. 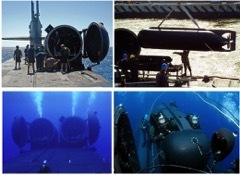 TACDEVEXes (Tactical Development Exercises) are special exercises usually run by a special submarine squadron - Tactical Development Squadron TWELVE, based out of Groton CT, and by COMSUBPAC, to test out new tactics or to more thoroughly evaluate new weapons or combat systems delivered to the Submarine Force. - The attached photo is our newest submarine under development. Okay, just kidding. We don't actually have a flying submarine that can drill through mountains. The photo is from the 1963 movie titled Atragon. As I mentioned earlier, submarines are blind underwater and almost never use active sonar, relying on passive sonar to ensure they don't run into other ships, and they rely on their navigation charts to ensure they don't run into the ocean bottom or shore. Unfortunately, the Atlantic and Pacific Oceans are vast and sometimes the charts are inaccurate, and amazingly, there are still uncharted underwater mountains. - The USS San Francisco was on its way to Australia, traveling at Ahead Flank speed, when it slammed into an uncharted underwater mountain. Of the 137 men aboard, 98 were injured, including one fatality. It was a miracle the San Francisco wasn’t sunk. The submarine's pressure hull survived intact, buffered by the ship's forward main ballast tanks as they crumpled into the mountain peak. - After the submarine limped back to port, NAVSEA engineers determined the San Francisco's bow was a complete loss. There was no way to fix the hull and have any confidence in the durability and life span of the repaired ship. So they cut off the bow of the USS Honolulu on its way through decommissioning, welding it onto the front of the San Francisco in place of its mangled counterpart. 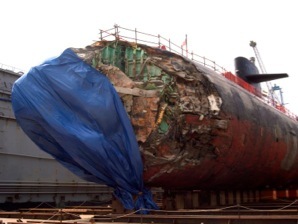 Unlike the San Francisco, which survived its disaster, the Russian submarine Kursk did not. 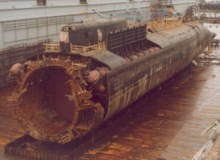 In 2000, while testing new torpedoes, there were two explosions in its Bow compartment, most likely from one of its torpedoes which suffered a fuel leak, which led to an intial explosion, and then a subsequent explosion from warheads in the Torpedo Room, which sank the Kursk, resulting in the loss of all hands. 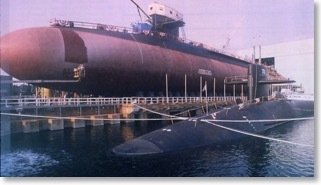 - The Kursk, minus its bow, was subsequently raised from the bottom a year later, as you can see in the photo. I've mentioned that going to periscope depth is a routine, yet hazardous evolution, since a submarine is never 100% sure what's up there, and surface ships travel much faster than a submarine at periscope depth and can bear down quickly on a submarine, which is not particularly maneuverable at PD. - You can see the sail of the Hartford is bent over, tilting to the side. It could have been disastrous - the collision almost ripped the sail from the top of the submarine. Well, tests don't always go as planned. This photo is one of the early Trident missile test launches, and I'm just guessing, but I don't think this is part of the 1st stage missile flight plan. When Things Go Wrong - Call the "Doc"
Submarines transit across the middle of the Atlantic and Pacific Oceans and to locations where medical assistance is days if not weeks away. Aside from SSGNs, who have a Medical Officer when SEAL units are aboard, submarines have a Corpsman, who are a Jack of All Trades. - If you're stuck in the middle of nowhere and can't get access to the appropriate specialty, the "Doc" will handle it. Break a bone? Call the Doc. Need a dentist? Call the Doc. Need an emergency appendectomy? Postpone dinner and clear the Wardroom table and... call the Doc. 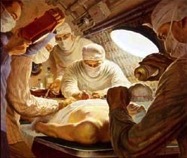 - The photo is titled "Submarine Appendectomy", from Esquire Magazine. Welcome to the final topic of Submarine 101! Homecoming! By now you've been at sea for 2 and a 1/2 months if you've been on an SSBN patrol, or 6 months on a fast attack deployment, counting down each day you've been away from your family, and as you pull into port, they'll be waiting on the pier! - It looks like this submarine is pulling into Pearl Harbor, since it's got a giant lei draped across the front of its sail. - It's been a tough patrol or deployment, being away from your family, especially your kids, and by now, you're ready to trade your buddies in for some well-deserved time at home. Well, that wraps things up! I hope you've enjoyed my Submarine 101 and learned a little bit about submarines along the way. I've had a lot of fun taking you on this virtual tour!